The Qualitative Study of Gender-Affirming Surgery Experiences in BC is the result of a collaboration between the Stigma and Resilience Among Vulnerable Youth Centre (SARAVYC) at the University of British Columbia, and Trans Care BC, a program of the Provincial Health Services Authority. Trans Care BC’s role is to enhance the coordination and availability of trans health services and supports across the province. 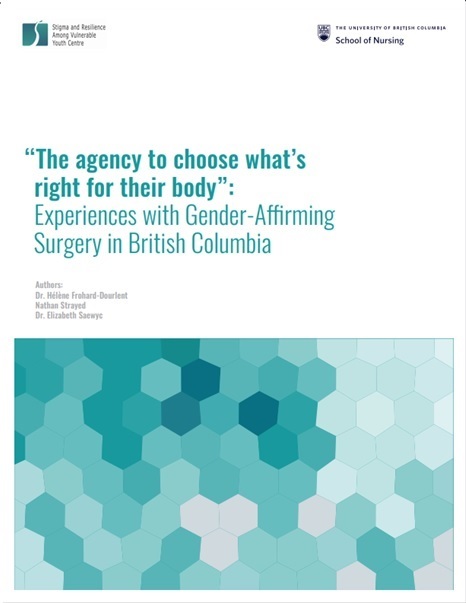 This report is the first to offer some insights into the experiences of people in British Columbia who seek to access gender-affirming surgery. We interviewed 35 people who had at least one surgical readiness assessment and/or one surgery while residing in British Columbia in the last 5 years. We hope that the stories that they shared can help identify gender-affirming and supportive practices, as well as gaps in the recent system of care, so that the information can help our province continue to move towards a patient-centered model of gender-affirming surgical care. Frohard-Dourlent H, Strayed N, & Saewyc E. (2017). “The agency to choose what’s right for their body”: Experiences with gender-affirming surgery in British Columbia. Vancouver, BC: Stigma and Resilience Among Vulnerable Youth Centre, School of Nursing, University of British Columbia.